The Washington Nationals' 2012 season was the eighth season for the baseball franchise of Major League Baseball in the District of Columbia, the fifth season at Nationals Park, and the 44th since the original team was started in Montreal, Quebec. After finishing the previous season in third place with an 80–81 record, out of last place in the NL East for the second time since moving to Washington, the Nationals made several moves to pursue playoff contention in 2012 and beyond. Despite being plagued with injuries, the Nationals had an impressive start to the season, never dropping below the .500 mark and consistently holding first or second place in their division. On September 3, the Nationals won their 82nd game of the season, making this season their first winning season since moving to Washington, D.C. in 2005 and the first for the franchise since 2003. On September 20, the Nationals beat the Los Angeles Dodgers to clinch the franchise's first postseason berth since 1981, and the first for a Washington-based team since the Washington Senators won the American League pennant in 1933. On October 1, the Nationals clinched the National League East division. On October 3, they went on to clinch the best record in Major League Baseball at 98-64. They finished the season with a 98-64 record and played the St. Louis Cardinals in the Divisional Series. On October 12, in Game 5 of the NLDS, they lost to the Cardinals 9-7 and were eliminated. On October 30, 2011, following the World Series, the Nationals granted Todd Coffey, Alex Cora, Jonny Gomes, Liván Hernández, Laynce Nix, and Iván Rodríguez free agency. On November 2, they also granted Luis Atilano, J.D. Martin, Shairon Martis, Garrett Mock, Óliver Pérez, Miguel Perez, Michael Aubrey, Matt Antonelli, Gregor Blanco, Buck Coats, and Jeff Frazier free agency. On November 3, Brian Bixler was selected off waivers by the Houston Astros, and on December 8, Erik Komatsu was selected by the St. Louis Cardinals in the Rule 5 draft (he was returned, via the Minnesota Twins, on May 29). On December 9, the Nationals traded Collin Balester to the Detroit Tigers for Ryan Perry. On December 12, Doug Slaten was granted free agency. Additionally, on October 31, the Nationals moved interim bench coach Pat Corrales back into a position in player development for the team. Corrales had assumed that role in June after the resignations of manager Jim Riggleman and interim manager John McLaren — McLaren had held the bench coach position under Riggleman. On December 23, the Nationals traded Brad Peacock and Tommy Milone, along with minor-league prospects Derek Norris and A.J. Cole, to the Oakland Athletics for left-handed starting pitcher Gio González and Oakland minor-league prospect Robert Gilliam. On February 19, 2012, Mike Cameron (signed on December 19) retired after seventeen years in the major leagues, with one All-Star appearance and three Gold Glove awards. On March 30, the Nationals granted Andrés Blanco (signed on December 16) free agency, and on April 2, the Nationals granted Chad Durbin (signed on February 1) free agency. On December 5, 2011, the Nationals signed Brett Carroll as a free agent. On December 11, they signed Jason Michaels; they released him on March 29, 2012 and re-signed him to a new contract on April 2. On December 14 they signed Jarrett Hoffpauir and Waldis Joaquin, on December 15 they signed Jeff Fulchino, on December 20 they signed Xavier Paul and Chad Tracy, and on December 22 they signed Mark DeRosa. On December 16 they signed Andrés Blanco, who they later released on March 30. On December 19, they signed Mike Cameron, who retired on February 19. On February 1, they signed Chad Durbin, who they later released on April 2. On January 4, 2012, the Nationals signed Dan Cortes, on January 26 they signed Brad Lidge, on February 2 they signed Edwin Jackson, on February 3 they signed Mitch Atkins, on February 6 they signed Mark Teahen, on February 28 they signed Mike Schultz, on March 18 they signed Xavier Nady, and on March 29 they signed Zach Duke. The Nationals held their 2012 spring training in Viera, Florida, with home games played at Space Coast Stadium. On April 3, 2012, the Nationals placed Drew Storen and Michael Morse on the disabled list to start the season, and John Lannan was optioned to Triple-A Syracuse. The Nationals also started a "Take Back Our Park" campaign vs. Philadelphia so Nationals fans in Maryland, Virginia, and Washington, D.C. could receive tickets for the series on May 4–6 in an advanced pre-sale. On April 28, 2012, top prospect Bryce Harper made his Major League debut vs. Los Angeles in Los Angeles, finishing with a double and a go-ahead sacrifice fly. The Nationals, however, would lose the game on a Matt Kemp walk-off home run in the bottom of the 10th inning. At the All-Star break, which began on July 9, 2012, the Nationals were in first place in the NL East with a 49–34 record, four games ahead of the second-place Atlanta Braves. On July 30, 2012, despite having an off day, the Nationals obtained the best record in baseball due to a loss by the Cincinnati Reds. This was the first time that a Washington baseball team held sole position of first place in MLB since 1933. On September 20, 2012, the Nats clinched their first Playoff berth since moving to Washington, with a 4-1 win over the L.A. Dodgers. On October 1, 2012, the Nats clinched the NL East when the Braves lost 2-1 to the Pirates. The Nats finished the season on October 3, 2012, defeating the Phillies 5-1. They finished with a 98-64 record, the best record in Major League baseball that year. The Nationals played 20 extra inning games during the season, the most of any MLB team in 2012. 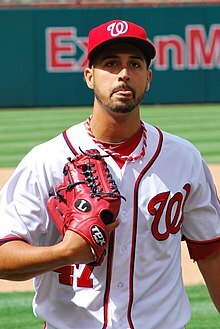 Nationals starting pitchers Stephen Strasburg and Gio González, and shortstop Ian Desmond, were chosen to represent the Nationals in the 2012 All-Star Game. Desmond decided not to participate in order to rest a sore oblique muscle; Michael Bourn of the Atlanta Braves was chosen to go in his place. Giancarlo Stanton of the Miami Marlins declined to participate because of a serious knee injury which required surgery, so the Nationals' Bryce Harper was chosen to play in his place. This made the 19-year-old Harper the youngest position player and the third youngest player to be named an All-Star. The Nationals therefore had four All-Stars, the most since they moved to Washington, D.C. The game was played on Tuesday, July 10, in Kansas City, and the National League won, 8-0. Gonzalez and Strasburg each pitched one scoreless inning; Gonzalez struck out one batter, and Strasburg allowed a hit and a walk. Harper entered the game in the fifth inning as a pinch hitter and played the remainder of the game in left field; at the plate, he went 0–1 with a walk. The Nationals drew 2,370,794 fans at Nationals Park during the regular season in 2012. It was the first time since 2006 that they had drawn more than 2,000,000 fans, and only the 2,731,993 they drew in their first season in Washington in 2005 exceeded it. It placed them ninth in attendance for the season among the 16 National League teams, also their best showing since 2005. Their highest attendance at a home game was on May 19, when they drew 42,331 for a game against the Baltimore Orioles, while their lowest was 14,520 for a game against the Houston Astros on April 18. Their average home attendance was 30,010 per game, second-highest since their arrival in Washington and the first time they had averaged over 30,000 a game since their first season in Washington in 2005. The Nationals played the St. Louis Cardinals in the Division Series. The Cardinals won the series, 3 games to 2. 1:07 p.m. (EDT) at Nationals Park in Washington, D.C.
4:07 p.m. (EDT) at Nationals Park in Washington, D.C.
8:37 p.m. (EDT) at Nationals Park in Washington, D.C. Complete offensive statistics can be found here. Complete pitching statistics can be found here. Ian Desmond did not participate in the 2012 Major League Baseball All-Star Game due to injury. ^ The two games on August 3 were played as a single-admission doubleheader with attendance counted only for the two games combined. ^ The two games on September 19 were played as a single-admission doubleheader with attendance counted only for the two games combined. ^ "Philadelphia Phillies vs. Washington Nationals - Recap - October 01, 2012 - ESPN". ESPN.com. Retrieved October 5, 2014. ^ "Philadelphia Phillies vs. Washington Nationals - Recap - October 03, 2012 - ESPN". ESPN.com. Retrieved October 5, 2014. ^ "CARDS SCORE 4 IN 9TH, BEAT NATS 9-7, REACH NLCS". AP. Retrieved October 13, 2012. ^ a b c d e f g h "2012 Washington Nationals Trades and Transactions". Baseball-Reference.com. Retrieved October 5, 2014. ^ Kilgore, Adam (October 31, 2011). "Pat Corrales to be replaced as Nationals bench coach – Nationals Journal". The Washington Post. Retrieved May 31, 2012. ^ "2012 Washington Nationals Schedule, Box Scores and Splits". Baseball-Reference.com. Retrieved October 5, 2014. ^ Kilgore, Adam (July 30, 2012). "The Nationals have the best record in baseball by themselves". Washington Post. Retrieved July 31, 2012. ^ "Team Batting Game Finder: For 2012, Only extra-inning games, sorted by greatest number of games in a single season matching the selected criteria". Baseball Reference. Retrieved August 26, 2017. ^ Corner, Jahmal (July 8, 2012). "Marlins' All Star Stanton has knee surgery". Chicago Tribune. Los Angeles. Retrieved July 9, 2012. ^ Wagner, James (July 7, 2012). "Bryce Harper named to the all-star game – Nationals Journal". Washington Post. Retrieved July 9, 2012. ^ "All-Stars". Washington Nationals. Retrieved October 5, 2014. ^ "National League All-Stars vs. American League All-Stars – Recap". ESPN.com. Kansas City, Missouri. July 10, 2012. Retrieved July 11, 2012. Wikimedia Commons has media related to 2012 Washington Nationals season.